Bellerive is Coeur D’ Alene's most desirable waterfront community on the Spokane River. This third floor condo does not have a river view but it has all the luxurious amenities you would expect, including the use of the day boat dock and the gym. This contemporary, newly furnished 2 bedroom condo will sleep 6. King bed in the master bedroom with a Casper mattress, queen bed in the 2nd bedroom with a new Posturepedic mattress, and a queen sofa sleeper with a high quality memory foam mattress in the living room. The kitchen is fully equipped with all you will need. The washer & dryer are located in the condo for your personnel use and convenience. The bathrooms are also supplied with toiletries, hair dryer and plush towels. Teak furniture on the balcony with a new propane grill. The living room features a gas fireplace and floor to ceiling sliding glass doors to the balcony. Three flat screen TV's on premium cable/sports with surround sound equipped with Bluetooth and high speed internet. Fully equipped condo with 5 spa terry bathrobes, board games, books, DVD's, iron and with all the comforts of home, you won't want to leave. Minimum 3 night stay.. Located in the Riverstone Development, it's a short walk to Starbucks, movie theaters, shopping and many restaurants. Also, The 24 mile Idaho Centennial bike/walk trail is steps away. 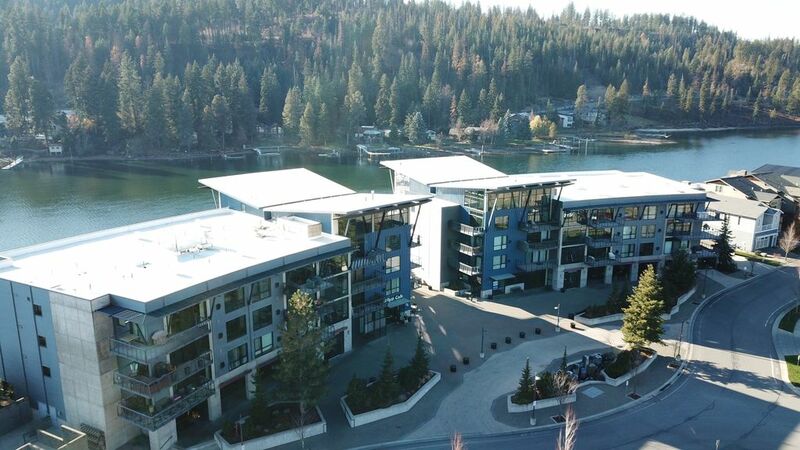 Downtown CDA is a short car 5 minute car ride away, where you will find the CDA Resort, bike/boat rentals, marina, beach, restaurants, shopping and much more. Located 3 minutes off of the I-90 FWY. Four bicycles and helmet's are also provided for your use. Two of the bikes are suitable for children. Overnight boat slips are available for rent at the Boardwalk Marina located at the CDA resort. Day use docks at the condo on the river are complimentary. NO PETS PLEASE> No SMOKING PLEASE. You will surely enjoy your stay!!! Crock pot Gas oven and gas cooktop. Day boat slip use. Boat not included. We had a great stay here. It was clean and beautiful and in a very nice location. The condo is in a perfect location! The positives: very clean, nice linens. wonderful beds, well supplied home-all you need is a toothbrush. I would and will stay here again if my plans allow. The breakfast/lunch restauran LePeep's t just below was perfect before a long ride. It is quite busy on the weekends. There is also lovely outside seating. The condo is actually nicer than the pictures. The owners were easily reachable and helpful. Property is exactly as described and represented in the photographs. Very clean and tidy. Felt modern and new. The owners were welcoming and easy to work with. The apartment was well appointed with everything you might need from cozy robes, to shampoo/conditioner, to paper products . Security deposit promptly refunded as promised. Only complaint, the washer was not working. We didn't want to disrupt our visit so we did not have the owner's address it while we were there. Given the owner's attention to detail, I imagine the situation has been resolved. Would absolutely stay there again. Sorry about that washer issue Daryl. The issue was addressed immediately upon your departure and has been repaired. Worked perfect for our purpose! Condo beautiful, exceptionally maintained lacking nothing which was needed for a wonderful experien. Loved this condo. Was exactly what I needed to enjoy my visit. Beautifully appointed with a industrial loft feel. Kitchen was huge and well equipped. Definitely will return. The owners were very responsive and easy to work with. Pride in ownership very apparent. Thanks for the great review Ann. So glad you enjoyed your stay and looking forward to your next visit. No Pets. Please remove your shoes at the front door. Check in time is flexible. Check out time is 11:00 A.M.